This blog is based on a question in the OTN JDeveloper and ADF forum. The Question was how to navigate from one selected tab to the next tab when the af:showDetailItem in the tab is a region and the button to navigate is inside the region. We implement two cases, the first is the easy one where the button to navigate is in the page holding the af:panelTabbed. 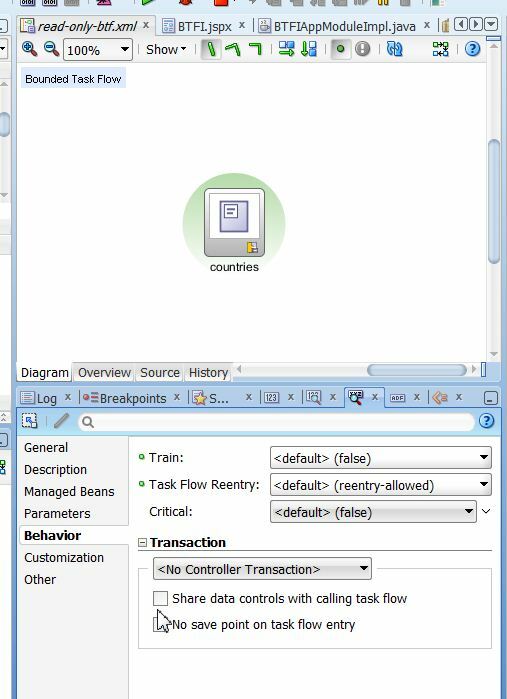 The second one uses a button is inside a bounded task flow which is shown in the af:showDetailItem in a tab to navigate the af:panelTabbed. We start with creating a new ‘ADF Fusion Web Application’ from the gallery. We only change the application name and the path of the application, otherwise we can just use the default values. The sample is simple and doesn’t need a model project or connection to a DB. You can download the finished workspace using the link provided at the end of the post. We skip all the needed steps and going right into creating the starting page which holds the af:panelTabbed. It has three af:showDetailItem and a af:Button to navigate the tabs directly from the page. This button implements the first use case. The button has a listener attached which is implemented in a viewScope bean ‘NavigateTabBean’. The listener implements the needed logic to navigate from the selected tab to the next tab. If the last tab is reached the first tab is selected. The logic in the action listener first searches for the af:panelTabbed in the viewRoot and gets the number of children from it. Each child is one of the af:showDetailItem representing a tab. Then we iterate over the child list and search the currently disclosed tab. We close this tab and the next tab in the list gets disclosed. If the currently selected tab is the last in the list, the first tab is disclosed (see the comments in the code section). To Implement the second use case, the one we really want to talk about, we first need to implement three bounded task flows which we later use as regions in the tabs. The image shows the bounded task flow for one tab. The other bounded task flows are build in the same way and are just showing different text. The reason for this is that you normally would use different regions aka different task flows in the tabs. We could have used only one bounded task flow with a parameter to change the text shown in the fragment. In the sample you’ll find this implemented for tabs 4 and 5. The region is simple and only shows one fragment which has a button to navigate to the next tab and a test to distinguish the regions when navigating. The whole magic is the parent action in the bounded task flow. This parent action executes a navigation case ‘nextTab’ in the parent task flow. In the image above we the the unbounded task flow which is the parent of the bounded task flow. 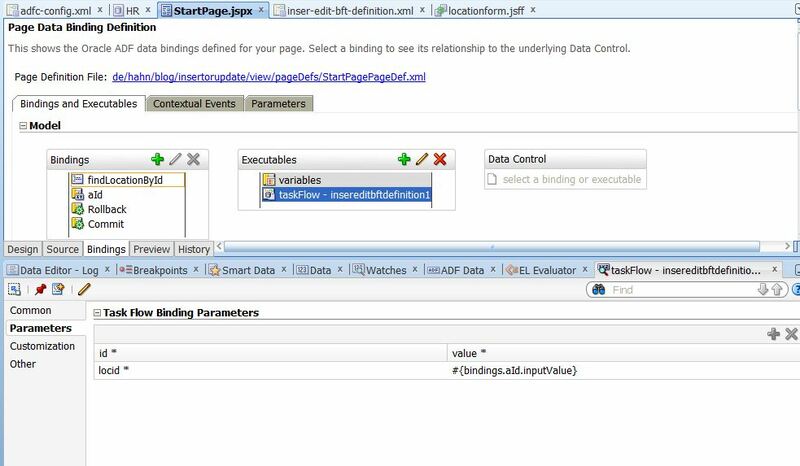 Here a wild card rule navigates to a method call activity ‘selectNextTab’ using the navigation case ‘nextTab’ we entered to the parent action of the regions. The method action calls the ‘nextTab()’ in the managed bean from the code section above. All this method does is to call the action listener which is called from the af:Button of the start page (Start.jsf). As the action listener needs an ActionEvent as parameter, which we don’t use in the code we pass ‘null’ when we call the listener from the method call activity. 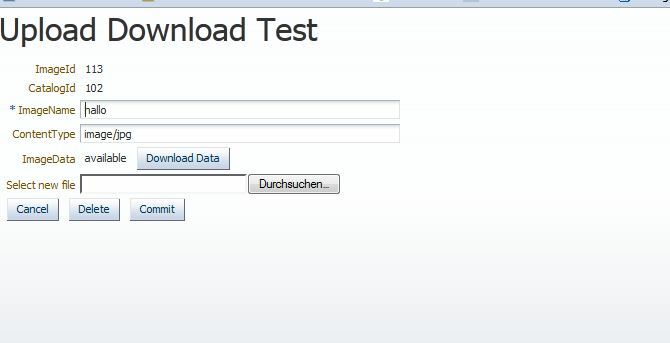 The sample application can be downloaded form ADFEMG Sample Project. in a text field the user enters a string which should be used to look-up data in the DB and show the data as a table in a region. For this we use the HR schema and build a look-up for locations after the name of the city of the location. In a page the user can insert the name or part of a cities name into a text field. This input is send as parameter to a bounded task flow. The default activity of the btf calls a method in the view object which uses a view criteria to search for cities starting with the given input data. In a second implementation the same technique is used but a where clause is used in the VO and the VO is called with executeWithParams. The result of the search is displayed as a table in a region. We start by creating a new ‘Fusion Web Application’ and creating a model project of the HR DB schema. Here we only use the location table for which we create entity object and view object. Now we create the view criteria which we use to find locations by part of the city name. Next step is to create the java class for the view object including the method to safely access the created bind variable. In the class we add a method to apply the created view criteria which we expose in the client interface well as the methods to access bind variables. 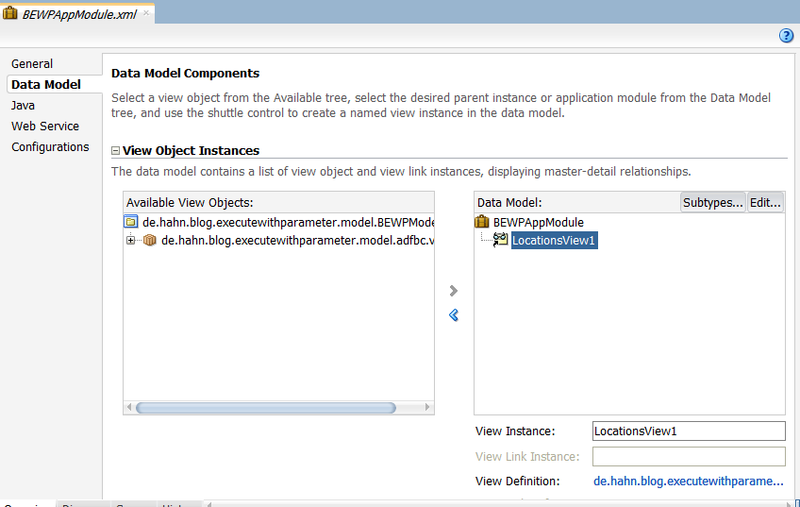 Finally we have to make sure that the locations view object is part of the data model of the application module. 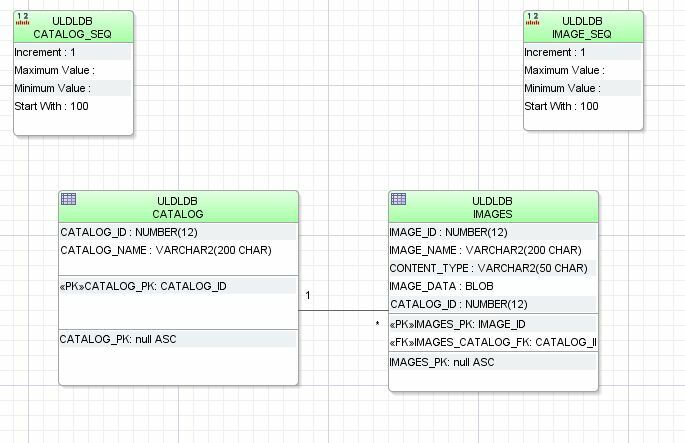 Next we add another view object to the data model which we use to implement the use case a second time. This time we use the view criteria we defined in the view object LocationsView and select it as the default where clause. We start implementing the view controller project by first adding a start page, ‘Start’, to the unbounded task flow in adfc-config.xml. For this page we use a quick layout (One Column, Header stretched). After opening the page (which creates it) we add a third grid row to the panelGridLayout we got from the quick layout which later holds the result table. In the first grid row we add a captain for the page, ‘Execute with param sample’, the second grid row we add an af:inputText which holds the users input for the city name to search for. Now we create a pageDefinition for the page, where we define a variable and an attribute binding which holds the users input into the inputText we added to a grid row below the header. As you see we set the autoSubmit property to true as we don’t have (and need) a button to submit the data to the binding layer. 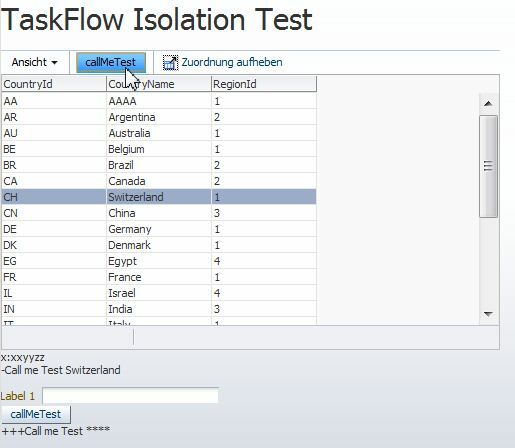 The next task is to create a new bounded task flow which has one input parameter, which is used to search for locations with cities starting with the given parameter from the inputText component. 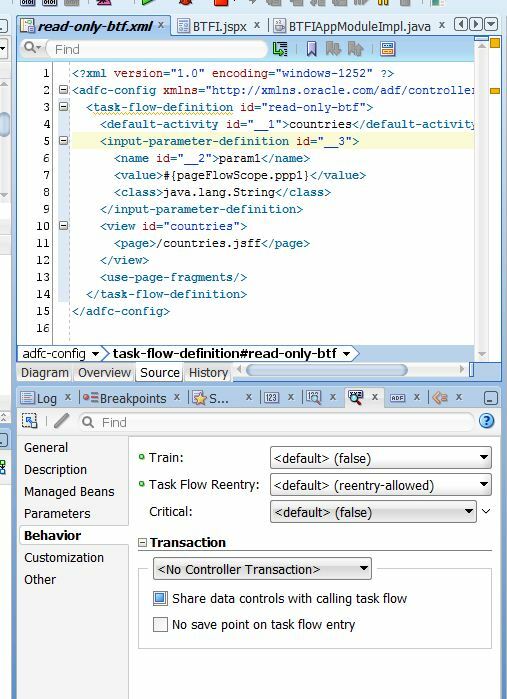 Once the bounded task flow is created we can drag this btf onto the start page and drop it in the girdCell in the third gridRow and wire the parameter for the task flow to the value we have stored in the in the variable iterator via the inputText. Finally we make the region refresh whenever the inputParamter of the task flow changes by setting the regions refresh property to ‘ifNeeded’. The sample application can be downloaded form ADFEMG Sample Project. 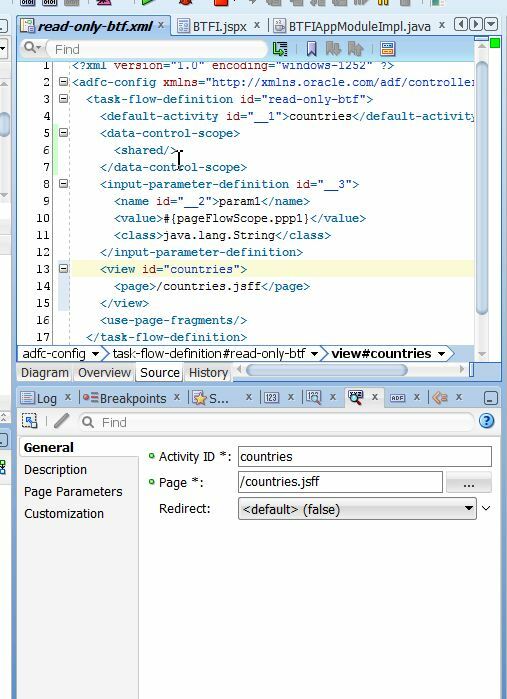 It contains a second page (Start2) which uses the other view object (LocationsWithParamsView) inside the region. It’s build like the first version. The difference is that the default activity nor is the executeWithParams from the VOs operations instead the self implemented method from the VO. You spare writing the method and exposing the method in the client interface this way. 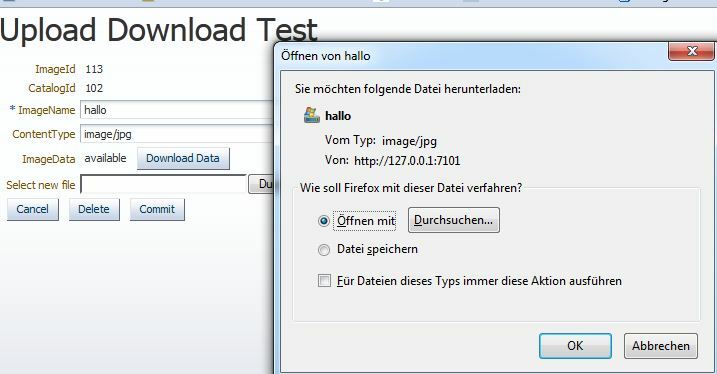 Be aware that the sample uses the HR DB schema and you have to change the connection information to point to your DB. 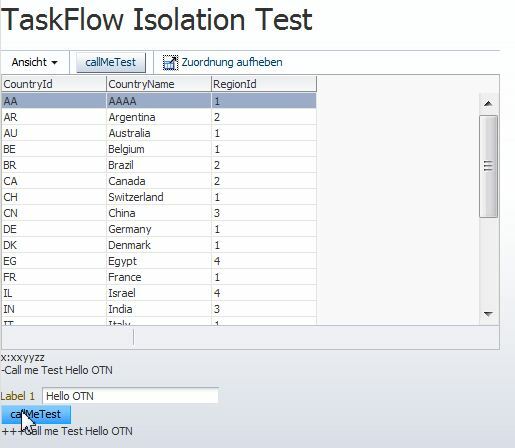 Based on a question on the OTN ADF forum I wrote a small sample to show how to use a router in a bounded task flow to either edit an existing row, or create a new row and present it to enter data. Based on a query which returns either zero or one row an edit form should should be presented to the user. This form show the data from the row found, or an empty form to allow creation of a new row. The sample workspace, which you can download from the ADF Samples webside using the link at the end of this post, uses a very simple model. It contains only one view object, based of the LOCATIONS table of the HR schema. The view object has one custom method implemented which search for a location record by an id. This method is used as query which returns either one row (if the location is found) or no row (if the location is not found). The UI is build with one page which has a splitter component. On the left facet we find an simple form which we use to input the location id to search for and a button to execute the query. To allow to save or cancel the actions we add a rollback and a commit button. On the second facet we see a region which shoes the panelForm to either edit the existing record or to enter data into a new created record. The image below shows the page layout. You clearly see the empty from to enter new row data. Now, to implement this the first splitter facet has a button to executes the query (find location by id) with the id given in the inputText. The region on the second splitter facet refreshes itself as we set the ‘Refresh’ property to ‘ifNeeded’. To make this work we need to change an input parameter to the region. 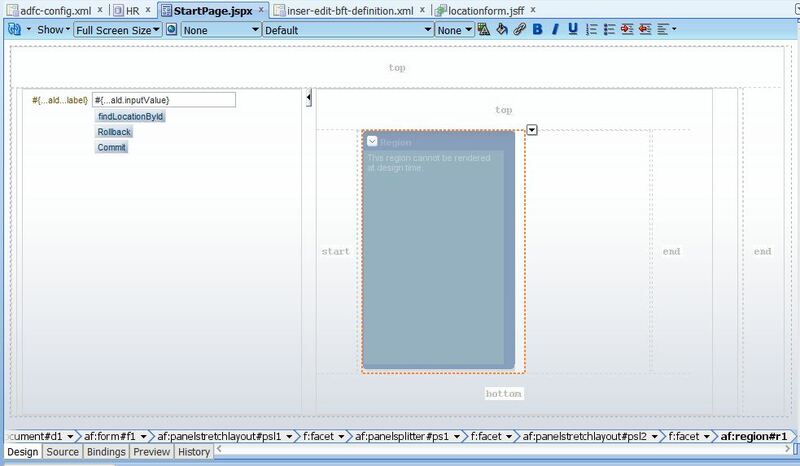 This is done by binding the input parameter of the region to the inputText component for the location id. So whenever the input parameter changes the region gets restarted. 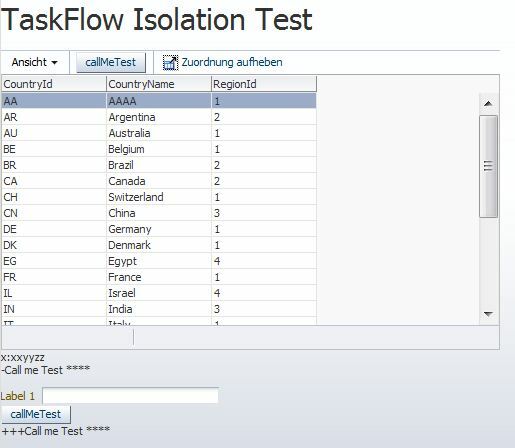 this effect we use in the bounded task flow to check if we have to create a new row and thus show a empty form, or to just edit an existing row. 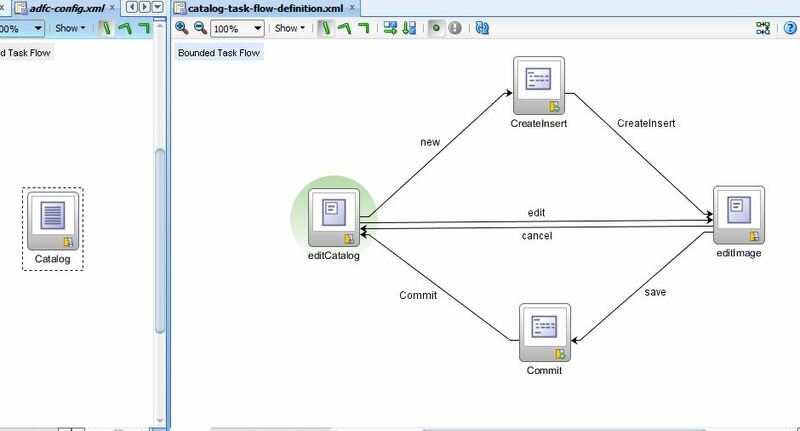 For this the bounded task flow uses a router component as start activity. This router checks if the iterator of the locations view object contains zero rows or more. The router navigates to the ‘insert’ case if the EL evaluated to true, to the ‘edit’ case otherwise. That concludes the use case. 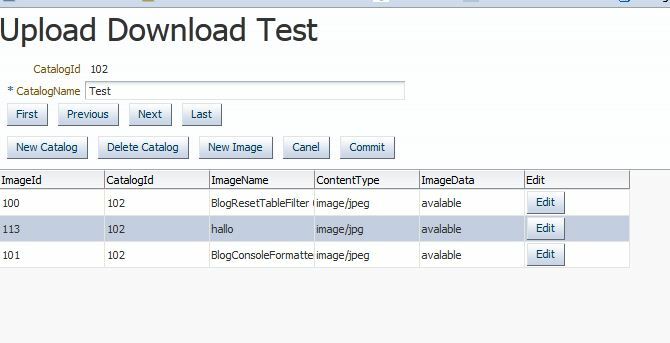 You can down load the sample work space from ADF Samples Repository. The sample was build using JDeveloper 11.1.1.5.0 but should work using 11.1.1.6.0 and 11.1.2.x too. It uses the HR schema and you need to correct the db credentials to run the sample.